Overall, this strip mall shop falls into the category of stores I’ll visit if I’m in the area and have a minute, but rarely do I make a trip solely there to thrift. It’s a decent place, don’t get me wrong, but I’m usually looking for clothes, and after many a visit to Hidden Treasures, I’ve yet to buy anything for my closet or my feet. I have, however, seen super deals on furniture ($3 for a solid wooden coffee table! A huge, huge mid-century desk for $9!) and think they have a stand-up collection of dishes and housewares. They frequently have sales (this week, for example, you can save 50 percent on all winter coats, hats, mittens and boots) and every week, they have a special silent auction that frequently features antiques and valuable electronics. The money raised here goes to support a handful of good causes including Masterworks of Minnesota, Care of Creation and The Garden of Hope. Top to bottom: An sweet brass deer ($2), Catalougue, A Book of Cat Names (50 cents) and the prettiest butterfly potholder I ever did see ($1). Other helpful hints: Sign up for their e-newsletter and be the first to know about sales and special events. While you’re there: Admire the strip mall! It was, after all, the first one built in Minnesota, owned and financed by the famed Batista family. Yes, the Cuban Basitstas. Like the folks who ran Cuba before Castro took over. Once you’re done, eat at Dairy Queen, return some books to the library, pick up some chai at Tea Source or fancy olive oil at Annona Gourmet. Hours: Monday through Friday, 10 a.m.-7 p.m., Saturday, 10 a.m.-5 p.m. 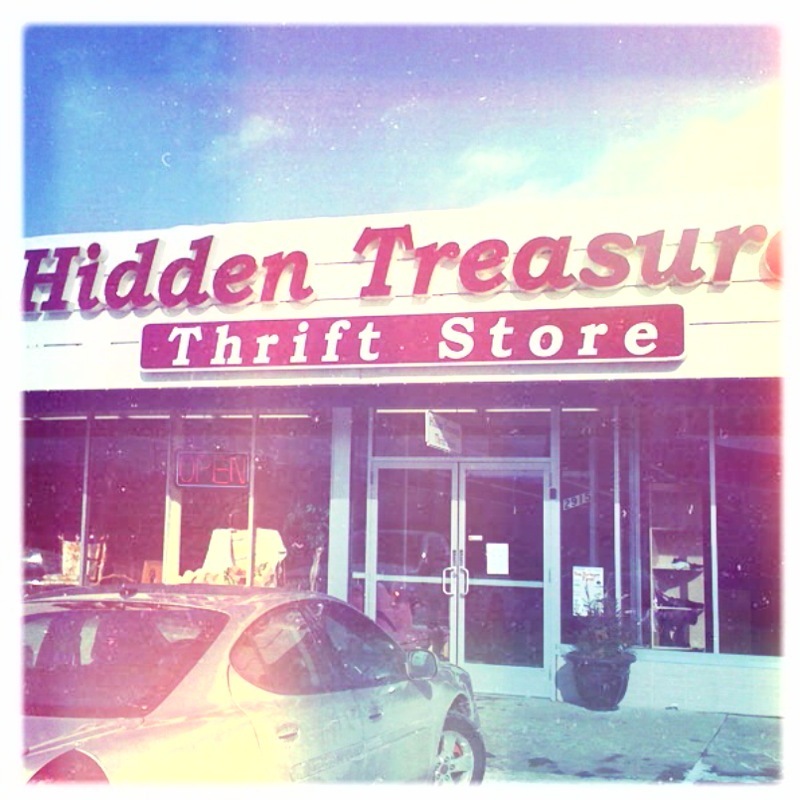 This entry was posted in Store Reviews and tagged st. anthony, thrift store, thrift-store review, thrift-store shopping, thrifting by highplainsthrifter. Bookmark the permalink. I’m so glad you posted this! I’ve never been in, but drive by it ALL the time. Next time… and damn it, i have your brass deer mate. I need to find myself another one so they can be friends.